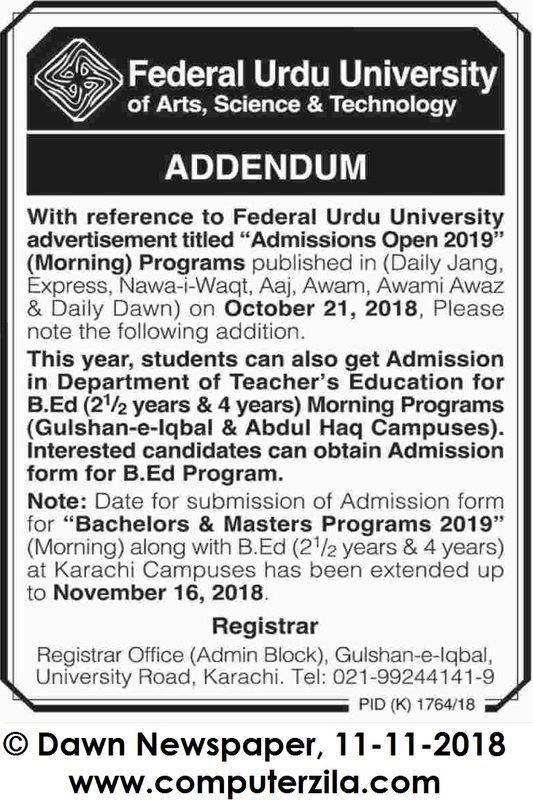 Admissions Open at Federal Urdu University of Arts, Science & Technology's Main Campus, Karachi for the batch Spring 2019. FUUAST offers admissions in different fields of study for Bachelor Programs. University DescriptionThe Federal Urdu University of Arts, Science & Technology (Urdu: وفاقی جامعہ اردو‬‎; alternatively known as FUUAST), is a public university primarily located in the residential Gulshan Town and Saddar of Karachi, Sindh, Pakistan. The university has two satellite campuses; the central campus is located in Islamabad while the secondary campus is located in Karachi. The university offers wide range of academic programs in undergraduate and post-graduate. The university is noted for its engaging research in fine arts, languages, engineering, social sciences and philosophy. With an tentative approximated of ~13,500 enrolled students currently attending the university, it is one of the largest institution in the country and is one of the top university in "general category" ranked by the Higher Education Commission of Pakistan.